Every MRI rigging situation is unique! Below we explain some of the factors that go into a MRI rigging and moving estimate. 1. What kind of magnet is it? This is important to know because system weights vary greatly. Open magnet MRI scanners are generally quite a bit heavier (Ovations weigh in the 42,000 lb. range) than their helium-filled, closed-bore brethren (1.5 tesla MRI’s 10,000 to 20,000 lb range). Additionally, open magnets are permanently magnetized, so care must be taken to minimize the impact of the magnetic field on the surrounding area while it’s being moved. On the other hand, a closed magnet has no magnetic field once taken off power, so moving down the hall past the IT server room won’t be an issue. 2. Where is the MRI magnet? This might sound like a silly question, until you think like a rigging contractor who has to figure out how to move a 6′ metal cube weighing up to 20 tons from the basement level MRI suite, up a 200′ sloped hallway with seven 90 degree turns, to an outside access pit where a crane operator has to set up his crane a football field’s length away (to avoid the well-manicured topiaries of your landscaped courtyard) from the pit, and has to pick up this monster without being able to see it himself. Or maybe the only access is through a 5th floor window and the crane has to be set up on a busy street. Many times, as people have gradually learned how drawn-out and delicate an MRI rig can be, the magnet is located on a ground floor suite with a pre-designed window wall that is fairly easily removed and replaced, and the crane can set up in the adjacent parking lot. In any case, the answer to “Where is your magnet?” is far more involved than a simple floor number. 3. Where in the world is your MRI located? We find that rigging costs can vary greatly based on your geographic location. Costs in a major city, especially in the northeast or on the west coast can cost quite a bit more than in the south or mid-west. Surprisingly, given the distances riggers have to travel to reach them, we’ve found that less urban areas can be pretty affordable for rigging work, but that more advance planning is often required to accommodate them. Rigging costs, will depend on the factors described above. Variable cost may include any of the contractor’s work to prepare an exit path, which may include interior and/ or exterior door and wall removal and replacement, highly technical mechanical de-installation and preparation for moving the MRI. Which Viking MRI Rigging is able to do all such requested work. For foreign rigging sites, additional unforeseen cost are the norm. Where pricing and exchange rates, availability of equipment, and “interesting” MRI suite locations can make the job even more costly. 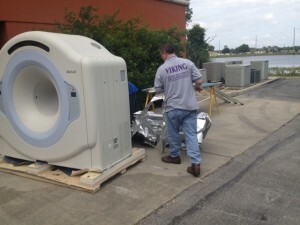 Viking Rigging is here to assist hospitals, companies and organizations with all their MRI rigging and moving needs. I will find you expert MRI rigging, moving and storage solutions. Viking MRI Rigging Call 772-807-0049 or 855-VIP-RIGS to Contact Us for help or a MRI Rigging Price Quote.